For the 2004 album and song by Bosnian singer Dino Merlin, see Burek (album). Börek (Turkish pronunciation: [bøˈɾekʲ]; also burek and other variants) is a family of baked filled pastries made of a thin flaky dough known as phyllo (or yufka), found in the cuisines of the former Ottoman Empire. A börek may be prepared in a large pan and cut into portions after baking, or as individual pastries. The top of the börek is often sprinkled with sesame seeds. It may have been invented in what is now modern Turkey, in the Anatolian Provinces of the Ottoman Empire in its early era, to become a popular element of Ottoman cuisine, or it may date back to the Ancient Roman cuisine of the region (cf. Baklava) or it may have been even older. Börek may have its origins in Turkish cuisine and may be one of its most significant and, in fact, ancient elements of the Turkish cuisine, having been developed by the Turks of Central Asia before their westward migration to Anatolia. A competing theory is that it is the same as the local Byzantine dish plakountas tetyromenous, itself a descendant of placenta, the ancient baked layered dough and cheese dish of Roman times. Börek in Turkish language refers to any dish made with yufka. One proposed etymology of the name is that it comes from the Turkic root bur- 'to twist', (similar to Serbian word savijača (from savijati/saviti - to twist) which also describes a layered dough dish). E.V. Sevortyan, in his Etymological Dictionary of Turkic Languages dedicates a lemma to BÖREK which offers various alternative etymologies, all of them based on a fronted vowel /ö/ or /ü/. Tietze's proposed source "bur-" (with a backed vowel /u/) for büräk/börek (with fronted vowels) is not included, which is logical because sound harmony would dictate a suffix "-aq" with a harmonised, backed /q/. Turkic languages in Arabic orthography, however, invariably write ك and not ق which rules out "bur-" which has a backed vowel /u/ at its core. In passing Sevortyan notes a possible Russian derivation from börek, Pirog (Russian: пирог "cake"). The diminutive version is Pirozhki (Russian: пирожки, little pirog). The name might even be related to the German and English word for bread. The Tatar böregi (Tatar böreks) is a cheese and mint filled alternative name for the dumpling-like dish called mantı which very much resemble tortellini. Börek is very popular in the cuisines of the former Ottoman Empire, especially in North Africa and throughout the Balkans. The Southern Slavic cuisines also feature derivatives of the börek. Börek is also part of Mizrahi and Sephardic Jewish traditions. They have been enthusiastically adopted by the Ottoman Jewish communities, and have been described, along with boyos de pan and bulemas, as forming "the trio of preeminent Ottoman Jewish pastries". Su böreği 'water börek' is one of the most common types. Sheets of dough are boiled briefly in large pans, then a mixture of feta cheese, parsley and oil is scattered between the layers. The whole thing is brushed with butter and laid in a masonry oven to cook. it may be thought of as a drier, sauceless version of lasagna. Sigara böreği 'cigarette börek' or kalem böreği 'pen börek', a smaller, cylindrical variety is often filled with feta cheese, potato, parsley and sometimes with minced meat or sausage. A variety of vegetables, herbs and spices are used in böreks, such as spinach, nettle, leek, and courgette, and usually ground black pepper. The name kalem böreği was adopted in September 2011 by some Turkish pastry organisations in order to avoid alluding to smoking. Paçanga böreği, is a traditional Sephardic Jewish specialty of Istanbul filled with pastırma or kaşar, and julienned green peppers fried in olive oil and eaten as a meze. Saray böreği 'palace börek' is a layered börek where fresh butter is rolled between each of the dough sheets. Talaş böreği or Nemse böreği 'sawdust' or 'Austrian' börek, is a small square börek mostly filled with lamb cubes and green peas, that has starchier yufka sheets, making it puffy and crispy. Kol böreği 'arm börek' is prepared in long rolls, either rounded or lined, and filled with either minced meat, feta cheese, spinach or potato and baked at a low temperature. Gül böreği 'rose börek', also known as Yuvarlak böreği 'round or spiral börek' are rolled into small spirals and have a spicier filling than other börek. Çiğ börek or Çibörek 'raw börek' is a half-round shaped börek, filled with raw minced meat and fried in oil on the concave side of the sac, very popular in places with a thriving Tatar community, such as Eskişehir, Polatlı and Konya. 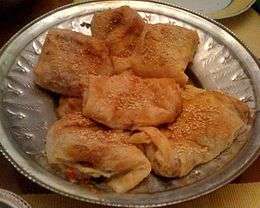 Töbörek is another Tatar variety, similar to a çiğ börek, but baked either on the convex side of the sac, or in a masonry oven instead of being fried in oil. Laz böreği, a specialty of the Rize region, is a sweet version, filled with muhallebi (Ottoman-style milk pudding or custard) and served sprinkled with powdered sugar. It similar with Greek Bougatsa. Kürt Böreği is similar to Laz böreği, without the custard filling. It is also called sade (plain) börek and served with fine powdered sugar. Most of the time, the word "börek" is accompanied in Turkish by a descriptive word referring to the shape, ingredients of the pastry, for the cooking methods or for or a specific region where it is typically prepared, as in the above kol böreği, su böreği, talaş böreği or Sarıyer böreği. In Albania, this dish is called byrek, burek, or lakror; the most common fillings include: cheese (especially gjizë, salted curd cheese), ground meat and onions (ragù style filling) which is sometimes called mesnik in the south, spinach and eggs, milk and eggs with pre-baked dough layers, but it can also be made with tomato and onions, peppers and beans, potato or a sweet filling of pumpkin, nettles (known as byrek me hithra), etc. Lakror generally would have a filling of greens, lakër being an Albanian word for cabbage but in this context an abbreviation of "lakër e egër", a term which describes a family of green leaf vegetables i.e. sorrel, dandelion, scarole, catsear, etc. Byrek is traditionally made with several layers of dough that have been thinly rolled out by hand. The final form can be small, individual triangles, especially from street vendors called 'Byrektore' which sell byrek and other traditional pastries and drinks. It can also be made as one large byrek that is cut into smaller pieces. Byrek is traditional to southern Albania but is made throughout the country with variations. They can be served cold or hot. Arab börek is often stuffed with minced or diced lamb or beef, or a mixture of the two. Various herbs and spices are used to flavour the meat, including; turmeric, fresh parsley and nutmeg, and concentrated pomegranate juice, which gives the mixture a unique sweet and tangy taste. Fried or caramelised onions are usually added to the meat, as well as the traditional Arab staple of fried almonds and sultanas or raisins. Traditional Arab cheeses, including Jibin Baladi and Jibin Arab are often used instead of, or together with the meat. The mixture is wrapped in a sheet of dough, and then fried or deep-fried until crisp, and resembles a large egg roll. While most börek are made with phyllo, some traditional cooks and those in the tribal areas prefer a hand-kneaded dough. Arab börek are most often served with other "dry" foods including kibbeh, with a jajik dip (yogurt, cucumber and garlic dip) forming an integral part of a traditional meze meal. In Armenia, byorek (բյորեկ) or borek (բորեկ), consists of dough, or phyllo dough, folded into triangles and stuffed with cheese, spinach or ground beef, and the filling is typically spiced. A popular combination is spinach, feta, cottage cheese (or pot cheese) and a splash of anise-flavoured liquor (such as raki). Assyrian burek is usually stuffed with spiced ground beef, though potatoes are also sometimes used instead. The stuffing is wrapped in a sheet of dough and then fried in oil and resembles egg rolls. The Bulgarian version of the pastry, locally called byurek (Cyrillic: бюрек), is typically regarded as a variation of banitsa (баница), a similar Bulgarian dish. Bulgarian byurek is a type of banitsa with sirene cheese, the difference being that byurek also has eggs added. In Bulgarian, the word byurek has also come to be applied to other dishes similarly prepared with cheese and eggs, such as chushka byurek (чушка бюрек), a peeled and roasted pepper filled with cheese, and tikvichka byurek (тиквичка бюрек), blanched or uncooked bits of squash with eggs filling. In Greece and Cyprus, boureki (μπουρέκι [buˈreki]) or bourekaki (μπουρεκάκι [bureˈkaki], the diminutive form of the word), are small pastries made with phyllo dough or with pastry crust. Pastries in the börek family are also called pita: tiropita, spanakopita and so on. A special type of boureki is found in the local cuisine of Crete and especially in the area of Chania. It is a pie filled with sliced zucchini, sliced potatoes, mizithra or feta cheese and spearmint, and may be baked with or without a thick top crust of phyllo. In Venetian Corfu, boureki was also called burriche, and filled with meat and leafy greens. Galaktoboureko is a syrupy phyllo pastry filled with custard, common throughout Greece and Cyprus. In the Epirus, σκερ-μπουρέκ (derives from the Turkish şeker-börek, "sugar-börek") is a small rosewater-flavoured marzipan sweet. The Pontian Greek piroski (πιροσκί) derives its name from börek too. It's almost identical in name and form to pirozhki (Russian: пирожки), which is of Slavic origin, and popular in Russia and further east. In Israel, bourekas (Hebrew: בורקס‎) became popular as immigrants who settled there cooked the cuisine of their native countries. Bourekas can be found made from either phyllo dough or puff pastry filled with various fillings. Among the most popular fillings are salty cheese, mashed potato, mushrooms, chickpeas, olives, spinach, eggplant and pizza-flavour. Most bourekas in Israel are made with margarine-based doughs rather than butter-based doughs so that (at least the non-cheese filled varieties) can be eaten along with either milk meals or meat meals in accordance with the kosher prohibition against mixing milk and meat at the same meal. Israeli bourekas come in several shapes and are often sprinkled with seeds. The shapes and choice of seeds are usually indicative of their fillings and have become fairly standard among small bakeries and large factories alike. For example, Salty cheese (Bulgarian cheese)-filled as well as Tzfat cheese (from the city of Safed) with Za'atar-filled bourekas are usually somewhat flat triangles with white sesame seeds on top. Less salty cheese-filled are semi-circular and usually made with puff pastry. Potato-filled are sesame topped, flat squares or rectangles made with phyllo and tend to be less oily than most other versions. Mushroom-filled are bulging triangles with poppy seeds. Tuna-filled are bulging triangles with nigella seeds. Eggplant-filled are cylindrical with nigella seeds. Bean sprout-filled are cylindrical without seeds. Spinach-filled are either cylindrical with sesame seeds or made with a very delicate, oily phyllo dough shaped into round spirals. Bourekas with a pizza sauce are often round spirals rising toward the middle or sometimes cylidrical without seeds, differentiated from the bean sprout-filled cyliders without seeds by the red sauce oozing out the ends. Bourekas can also be found with mashed chickpeas, tuna and chickpea mix, pumpkin and even small cocktail frankfurters. Another variation filled with meat (beef, chicken or lamb), pine nuts, parsley and spices are eaten mainly as a main dish but sometimes as meze. The North African version, Brik can also be found in Israel. Bourekas come in small, "snack" size, often available in self-service bakeries, and sizes as large as four or five inches. The larger ones can serve as a snack or a meal, and can be sliced open, and stuffed with hard-boiled egg, pickles, tomatoes and skhug, a spicy Yemenite paste. Supermarkets stock a wide selection of frozen raw-dough bourekas ready for home baking. Bakeries and street vendors dealing exclusively in bourekas can be found in most Israeli cities. Small coffee-shop type establishments as well as lottery and sports betting parlors serving bourekas and coffee can also be found. Meat bourekas are less common at bakeries and are considered something which is to be made at home. Meat bourekas are made from lamb, beef or chicken mixed with onion, parsley, coriander, or mint, pine nuts and spices, They are served as hot meze. In recent years, Israelis have become aware of the high fat (especially trans-fat) content of bourekas leading many to question the dangers associated with their consumption. Bourekas have given their name to Bourekas films, a peculiarly Israeli genre of comic melodramas or tearjerkers based on ethnic stereotypes. In certain Italian towns of Emilia-Romagna that were formerly city-states such as Ferrara and Modena, there can still be encountered a half-moon shaped sweet pastry called burriche or burricche which has been described as a mediaeval relic of the Ottoman inspired cuisine of the Jewish communities that lived in certain towns of the area. There can be distinguished the burriche ferraresi, to which grappa is being added and which are often filled with mandarin marmelade and which are sometimes called in Ferrarese Ladino burichitas. They resemble in shape and taste the Greek kourabiedes, which are pâte brisée like shortbreads that differ from their Middle Eastern counterparts by having also alcohol such as brandy or mastika added to them. In the nations established or reestablished in the stead of the territories of the former Yugoslavia, burek is regularly available at most bakeries, and usually eaten as "fast food". It is often consumed with yogurt. Apart from being sold at bakeries, burek is served in specialised stores selling börek (or pitas) and yogurt exclusively (Buregdžinica). In the former Yugoslavia, burek, also known as pita in Bosnia and Herzegovina exclusively, is an extremely common dish, made with yufka and the Bosnian variant is arguably the most regionally prominent. It may be eaten for any meal of the day. In Bosnia and Herzegovina, the burek is a meat-filled pastry, traditionally rolled in a spiral and cut into sections for serving. The same spiral filled with cottage cheese is called sirnica, with spinach and cheese zeljanica, with potatoes krompiruša, and all of them are generically referred to as pita. Eggs are used as a binding agent when making sirnica and zeljanica. This kind of pastry is also popular in Croatia, where it was imported by Bosnian Croats, and is usually called rolani burek (rolled burek). In Serbian towns, Bosnian pastry dishes were imported by war refugees in the 1990s, and are usually called sarajevske pite or bosanske pite (Sarayevan pies or Bosnian pies). Similar dishes, although somewhat wider and with thinner dough layers, are called savijača or just "pita" in Serbia. These are usually homemade and not traditionally offered in bakeries. In 2012, Lonely Planet included the Bosnian burek in their "The World's Best Street Food" book. In Serbia, Macedonia, Croatia, Montenegro and Slovenia, burek is made from layers of dough, alternating with layers of other fillings in a circular baking pan and then topped with a last layer of dough. Traditionally it may be baked with no filling (prazan), with stewed minced meat and onions, or with cheese. Modern bakeries offer cheese and spinach, apple, sour cherries, potato, mushroom and pizza-burek, as well. The recipe for "round" burek was developed in the Serbian town of Niš. In 1498, it was introduced by a famous Turkish baker, Mehmed Oğlu from Istanbul. Eventually burek spread from the southeast (southern Serbia, Kosovo and Macedonia) to the rest of Yugoslavia. Niš hosts an annual burek competition and festival called Buregdžijada. In 2005, a 100 kg (220 lbs) burek was made, with a diameter of 2 metres (~6 ft) and it is considered to have been the world biggest burek ever made. In Slovenia, burek is one of the most popular fast-food dishes, but at least one researcher found that it is viewed negatively by Slovenes due to their prejudices towards immigrants, especially those from the countries of Former Yugoslavia. A publication of a diploma thesis on this at the Faculty of Social Sciences of the University of Ljubljana in 2010 stirred controversy regarding the appropriateness of the topic. The mentor of the student that had written the thesis described the topic as legitimate and burek as denoting primitive behavior in Slovenia in spite of it being a sophisticated food. He explained the controversy as a good example of the conclusions of the student. Actually, already in 2008, an employee of the Scientific Research Centre of the Slovenian Academy of Sciences and Arts (SRC SASA) had attained his PhD degree with a thesis on meta-burek at the University of Nova Gorica. Çibörek, a national dish of the Crimean Tatars, is made from unleavened dough filled with ground lamb, onions and spices, fried in oil. It is a common street food in countries that were once part of the USSR. Cheburek is the Russian pronunciation of çibörek, which means "delicious burek" or "raw börek". The regional cuisine of the Moldavian West bank of the Pruth still yields a type of dumpling-like food called burechiuşe (sometimes called burechiţe) which is described as dough in the shape of a ravioli-like square which is filled with mushrooms such as Boletus edulis, and sealed around its edges and then tossed and subsequently boiled in borscht like soups or chorbas. They are traditionally eaten in the last day of fasting at the time of the Christmas Eve. It is not clear if the burechiuşe derive their name from the Turco-Greek börek (which is a distinct possibility given the fact that Ottoman Moldavia was ruled for many decades by dynasties of Greek Phanariotes who encouraged Greek colonists to settle in the area), so at the receiving end of cultural and culinary influences coming from them, or it takes its name from that of the mushroom Boletus (burete in its Romanian language rhotacised version, and it meant "mushroom" as well as "sponge") by the pattern of the ravioli, which were named after the Italian name of the turnip with which they were once filled. Brik (pronounced breek) is a Tunisian and Algerian derivative of the börek consisting of thin malsouka pastry around a filling, commonly deep fried. The best-known version is the egg brik, a whole egg in a triangular pastry pocket with chopped onion, tuna, harissa and parsley. Brik pastry (malsouqa or warka) is made by slapping a sticky lump of dough onto a hot non stick surface in overlapping circles to produce the desired size and cooked for a minute or two. Typical fillings include tuna, ground meat, chopped boiled egg, chicken, shrimp, or anchovies garnished with a fried egg and harissa, capers, or cheese. The Tunisian tradition is that the bride-to-be's mother makes a brik for the potential bridegroom. If the bridegroom eats it without spilling any of the egg yolk he may marry the bride. The dough sheets themselves, are also referred to as walsouka or warka. ↑ Oxford Companion to Food, s.v. 1 2 3 Algar, Ayla Esen (1985). "The Complete Book of Turkish Cooking". ISBN 0-7103-0334-3. 1 2 Perry, Charles. "The Taste for Layered Bread among the Nomadic Turks and the Central Asian Origins of Baklava", in A Taste of Thyme: Culinary Cultures of the Middle East (ed. Sami Zubaida, Richard Tapper), 1994, ISBN 1-86064-603-4. 1 2 Patrick Faas (2003). Around the Roman Table: Food and Feasting in Ancient Rome. Chicago: University of Chicago Press. p. 184. ↑ Ahmet Toprak. "Articles on Turkish language". late 1980s. Retrieved 2015-01-27. 1 2 Иванова, Ценка. "Кулинарните недоразумения на българско-сръбската езикова граница" (in Bulgarian). Liternet. Retrieved 2007-02-08. ↑ Κοπιάστε στην Κουζίνα μου. Υγιεινές – αυθεντικές Ελληνικές και Κυπριακές συνταγές Archived March 8, 2012, at the Wayback Machine. ↑ "Bye-bye bourekas?". HAARETZ. 2011-03-29. Retrieved 2011-03-29. 1 2 Parker Bowles, Tom (2012). The World's Best Street Food. Lonely Planet. p. 224. ISBN 978-1-74220-593-9. ↑ Johnson, Richard (2012-02-24). "The world's best street food". London: The Guardian. Retrieved 1 March 2012. ↑ Doderović, M. (2004-07-08). "Draži burek nego "Mek"". Glas Javnosti (in Serbian). Glas Javnosti. Retrieved 2006-09-06. ↑ K., D. (2005-09-05). "Slistili i burek od 100 kila". Glas Javnosti (in Serbian). Glas Javnosti. Retrieved 2006-09-06. ↑ "U Nišu okupljeni ljubitelji bureka...". Revija UNO 129 (in Serbian). NIP "Druga kuća". Retrieved 2006-09-06. ↑ Rudovič Žvanut, Bojana (2010). Pomeni bureka v Sloveniji: diplomska naloga [The Meanings of Burek in Slovenia: Diploma Thesis] (PDF) (in Slovenian and English). Faculty of Social Sciences, University of Ljubljana. ↑ Černic, Andrej (22 January 2011). "Neverjetno - na FDV je mogoče diplomirati iz bureka!?" [Incredible - It is Possible to Graduate on the Faculty of Social Sciences with Burek!?]. Reporter (in Slovenian). Prava smer, d. o. o. ↑ "Peter Stankovič: Burek je sofisticirana hrana" [Peter Stankovič: Burek is Sophisticated Food] (in Slovenian). Siol.net. 31 January 2011. Archived from the original on 2011-02-02. ↑ Mlekuž, Jernej (2008). Predmet kot akter? Primer bureka v Sloveniji [Artefact as Actor? The Case of the Burek in Slovenia] (PDF) (in Slovenian and English). Faculty of Graduate Studies, University of Nova Gorica. Retrieved 31 January 2010. ↑ "Študentka FDV diplomirala na temo Pomeni bureka v Sloveniji" [A Student at the Faculty of Social Sciences Graduates with the Topic Meanings of Burek in Slovenia]. Pomurec.com (in Slovenian). 14 January 2011. Retrieved 1 February 2011. ↑ Photo of a plate with "ciorba de burchite"